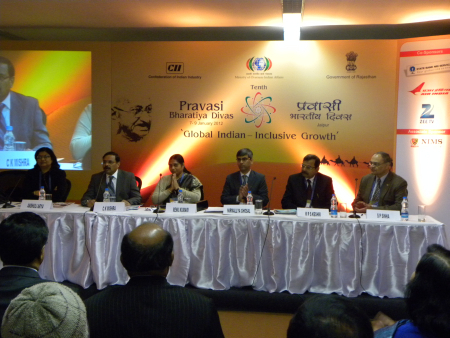 On the third day of the Pravasi Bharatiya Diwas in New Delhi individual states made their own presentation to the pravasi's (expatriates) asking them to invest in their state. NRIs lean towards the state from where they originally come from. It was no different in the case of Bihar. All the guests were from Bihar and now settled overseas. All of them were all praise for the government there now. 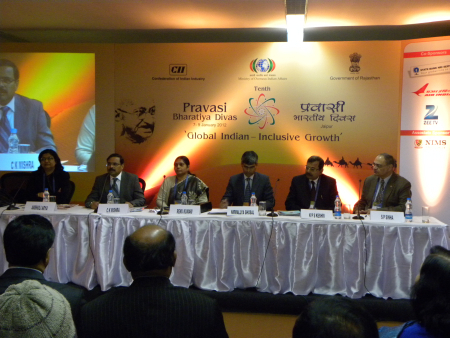 The panel was made up of state Minister of Industries and high ranking officials. They praised the governance in Bihar since Nitish Kumar came to power but none of them mentioned their Chief Minister of 15 years Lalu Prasad Yadav who was the cause of Bihar's sad state of affairs. CK Mishra, representing the government, said Bihar was growing at the rate of 14 per cent, which was far ahead of the national growth rate. NRIs said earlier they were ashamed to admit that they were from Bihar but now proudly announce it. They said their first priority was power as Bihar faces 20 hours power cut a day and half the villages have not been electrified. They said they have halted the exodus of girls from school in standard nine by giving them cycles. 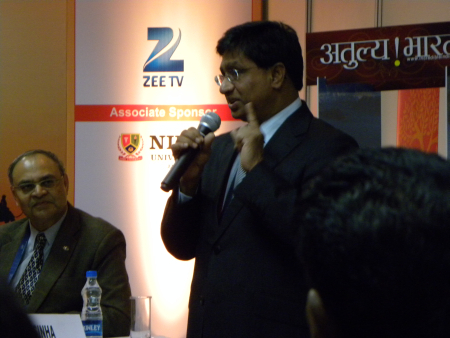 v. Agriculture is their strength and therefore food processing industry would do well. vi. Last year they saw four lack tourists, which was more than Goa. Forty units are coming up in Bihar every month for the last three years. There was an abundance of food grains. They were the largest producers of fruits and vegetables. Thirty-five per cent of fruits and vegetables were wasted and in the next five years they would bring this down to below 10 per cent. The government will contribute 40 per cent of the funds when companies come in and 35 per cent if individuals invest. Image: Forty units are coming up in Bihar every month. It was not funds alone that they need but also ideas. Industries in Bihar get 22 hours of uninterrupted power supply and sometimes 20 hours. It was the households that face drastic cuts. They were also putting up a handloom production infrastructure in Bagalpur and a Jute park in Purnea. There were 2,361 units in industrial areas now. In the 1960s, Bihar produced 25 per cent of the country's sugar. Now it was three per cent of the country's production. In the last three years, they have increased production from 30,000 tcd per annum to 72,000 tcds. Three years ago there were six mills and now there were 12. Next year there would be 16. Their aim is to go back to their 25 per cent of the national output. Bihar has the highest illiteracy in the country. But now it boasts of the highest growth in education in the last decade. In the road sector, the aim is that anyone from any part of the state should be able to reach Patna in six hours. The hospitality sector will be encouraged in Bodh Gaya and other Buddhist pilgrimage centres and also Sufi centres. There are now Primary Health Centres in all 534 blocks of the state. In 2006, 45,000 women delivered babies in hospitals and now 16.3 lack women deliver in hospitals. Most of the NRIs praised Bihar and said they were interested in investing in power sector, cement industry and hospitality sector. All in all it was a powerful presentation. Image: Industries in Bihar get 22 hours of uninterrupted power supply.